What a view it is! This historic landmark boasts one of Bloomington's top long range views overlooking beautiful Lake Monroe. The Scenic View name has been a part of Bloomington for over 30 years. The space has been reinvented as Bloomington's great destination place. The Lodge overlooks Indiana's largest lake, adorns a magical sunrise view & has remarkable seasonal views of vibrant autumn colors. Scenic View's 20 acre property backs up to the Hoosier National Forest for endless hiking & exploring opportunities. The Lodge is nearby several city & state Park & Recreation areas including beautiful Brown County & Nashville. The Lodge is only 2 miles from Lake Monroe, so bring your boat! There is plenty of parking for multiple vehicles and boats. 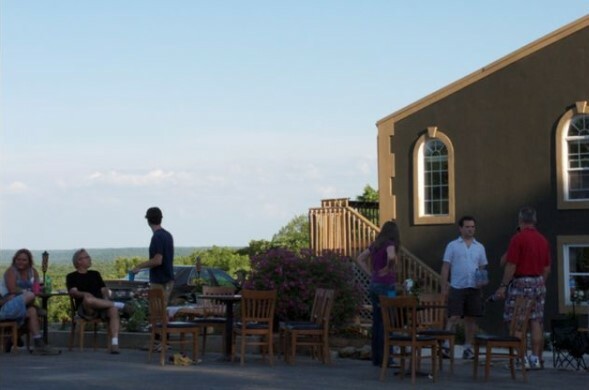 Scenic View Lodge is 10 miles from Indiana University & Downtown Bloomington which offers great cultural & art venues & a fantastic local dining scene. During your stay, visit The View Restaurant & Beer Garden (opened 2009) for good food & entertainment, just a short walk across the shared parking lot. The 4000 square foot Lodge offers 8 bedrooms, 5 ½ baths, a large shared dining area & living space, den & bar, kitchen, laundry facilities. Each spacious room has been distinctly arranged & decorated with your comfort in mind. The owners have thought of everything to make your stay as pleasurable as possible. If arranged in advance, additional sleeping may be provided for any of the bedrooms. Located upstairs, the Red Oak Master offers a white cedar King size bed with tempurpedic memory foam mattress. 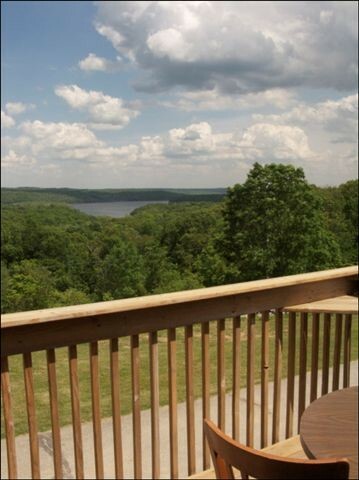 The room has a private outdoor deck with a magical view of Lake Monroe & the surrounding Hoosier National Forest. The Red Oak room has a full bath with shower & Jacuzzi tub The room has an adjoining smaller bedroom (the Acorn room), perfect for additional guests, a baby room or a dressing room. The Acorn room has two twin beds. Also located upstairs, the Silver Maple, offers a white cedar King size bed and 2 twins. This room boasts the best view of the lake from its own private deck. There is also a private full bath with shower. Located on the main level of the Lodge, the Beech Tree bedrooms offer two separate bedrooms which share a full bath with shower & bathtub. One room has a Double size bed and the other a bunk bed (one Double size bed under a Twin Bed). Located off the game room wing of the Lodge, the Sycamore Loft, is a two level room with full bath with shower & bathtub, and a private upstairs sleeping area. This room has a white cedar full size bed downstairs and upstairs is a king log bed. This large space with island/bar & kitchen table is perfect cooking, dining & entertaining. The kitchen is fully stocked with cookware, dishes, utensils & appliances. Outdoor grill also available. This signature room has quite a wow factor with its grand staircase, vaulted ceiling & floor to ceiling windows that capture the View so well. Large enough for a dining room & living room, it's been the favorite room in the Lodge with a conference dining table. Sit at our game tables and catch the game scores on the 50 inch flat screen TV. The den is full of just that: Play a local favorite of toss the Corn Hole, located in the carport area. Step outside onto the patio and relax in your own private 6 person hot tub. The therapeutic jets really hit the spot. The outdoor event site/gathering area overlooking the lake is perfect for family bbq's, evening cocktail events, weddings and more! Be sure to gather around the mini fire pit on those brisk fall evenings. Outdoor activities are nearby such as hiking, biking, hunting, fishing & boating. Have lunch or dinner on the outside patio or front porch surrounded by beautiful flower beds & landscaping, overlooking the spectacular view. Explore the wooded backyard of the Hoosier National Forest. Discover the natural beauty of Southern Indiana at its best. It is not uncommon to see deer, wild turkey, and various birds during a hike through the forest. Be on the lookout for bald eagles soaring over the lake. Catering from Scenic View Restaurant is available for any event with advanced notice. The initial price is for up to 8 adults at $565 per night, year around. Each extra person per night above the initial 8 people is $50. All children must be counted in the total number of guests when booking this lodging. Scenic View Lodge has been Monroe County landmark for more than thirty years. Come see what makes this property so unique; come be a part of the tradition. you can CHECK IN DIRECTLY to Scenic View.